(mailing list archive) Figment Festival this weekend – and more! Subject: Figment Festival this weekend – and more! Hello! 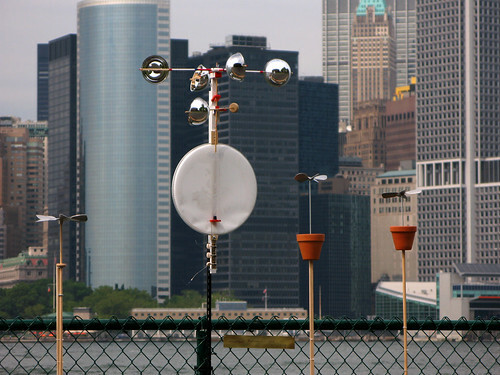 This coming weekend is the Figment Festival on Governors Island in NYC. It’ll be three days of art, performance, and installations, including some wind powered sound sculptures that I’m working on right now. The island is beautiful, one of Olafur Eliasson’s waterfalls will be right there, and my piece will be on the waterfront near Castle Williams, the round fort at the northwest corner of the island (take a right from the ferry landing). Please join me if you can for a potluck picnic on the castle lawn, Saturday at 1:00 (Sunday if Sat. is rainy). I’ll be at the festival for the whole weekend– please let me know if you plan to attend! The ferry [schedule and directions] is fast and free– catch it right around the corner from the Staten Island Ferry, near Whitehall and South Ferry stations. While you’re there, go right next door to David Byrne’s fun installation, Playing the Building. It’s time for Handmade Music Night again on Sunday, July 8 at 7pm at Etsy Labs, 325 Gold St, 3rd Floor, Brooklyn. Share your homemade musical instruments and synthesizers, and see what other people have made. It’s free and fun! I’ll be bringing my Figment sound sculptures if they survive the island. Here’s some coverage of previous events. Oh yeah, and here’s a video piece about it from Current TV where you can see me making a fool of myself on camera! I’ll be teaching a studio class on sound sculpture at Parsons School of Design this fall. The goal of the class is to put together an orchestra of networked sound machines that play in concert with each other. I’m looking for a gallery or performance space that would be willing to host the final installation for a weekend or up to a week or two in early to mid-December, so please let me know if you have any leads! Earlier this month I had the opportunity to do a short residency at the Exploratorium in San Francisco, messing around with handmade musical instruments with the people of the Playful Invention and Exploration Institute. It was a lot of fun and a dream come true for me, since I developed my love of science-with-art attending this strangest and most interesting of science museums as a child. I hope to do more work there soon! As always, you can see more of what I’m up to at my web site moonmilk.com (a bit neglected right now, but I’ll try to update it soon) and my flickr page. p.s. I put this links section here in case any of you are reading this in plain text instead of HTML. Was this useful? Let me know! p.p.s. I apologize if you get two copies of this. I blame Dreamhost!